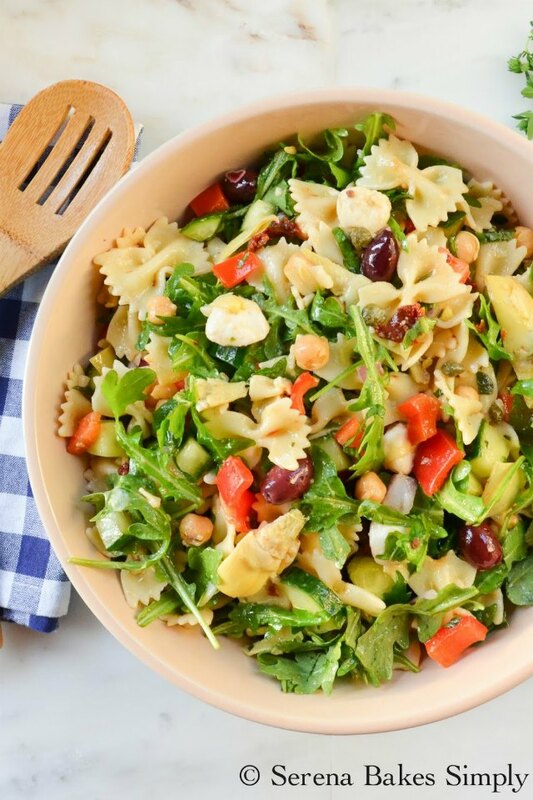 I love, love, love this Mediterranean Pasta Salad for our road trips, picnics and adventures since it's meatless yet chock-full of goodies like arugula, garbanzo beans, artichoke hearts, kalamata olives, capers, sun-dried tomatoes, mozzarella cheese tossed with a fresh herb vinaigrette. It's pure deliciousness in a bowl! If garbanzo beans aren't your flavor try subbing with cannellini beans aka white kidney beans. I usually make this when we go camping as our first lunch or dinner since there's so much work to do setting up camp and getting organized it takes the stress out of fixing a meal. It can be packed into Mason Jars for easy individualized servings on the go. 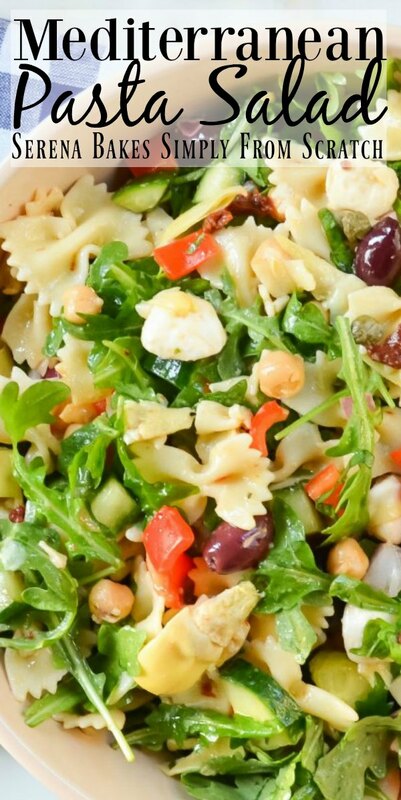 Mediterranean Pasta Salad is best made the day before to allow the flavors to meld and pasta to absorb the dressing making it easy to grab and go on your way out the door. It's so, so, so good I know you'll love, love, love it too! Shake until well combined and set aside. Toss with 3/4 of the Fresh Herb Vinaigrette. Add 8 ounces Fresh Mozzarella Cheese and toss until well coated. Add additional vinaigrette as needed. Cover and refridgerate until cold. Add 4 ounces Arugula or spinach. Add 1/3 cup Chopped Fresh Basil and toss until well combined. Keep salad cold until ready to serve. Check out all that deliciousness in each bite! The perfect meal for your summer adventures! 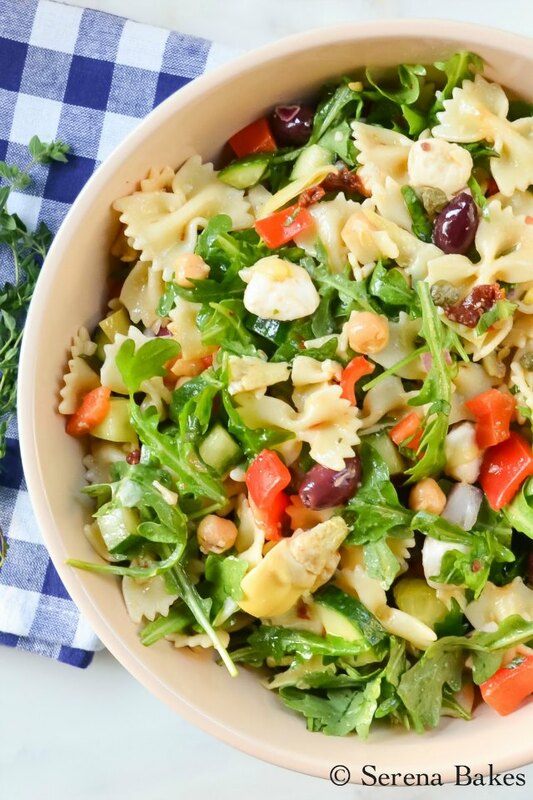 Mediterranean Pasta Salad is a summer time must make! At least in our house! 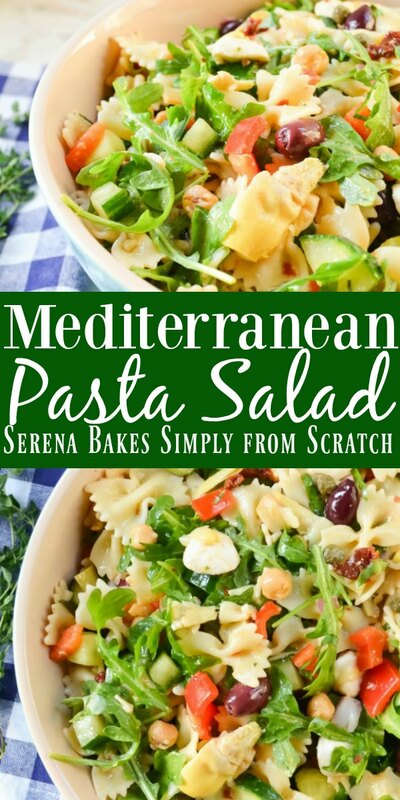 Mediterranean Pasta Salad is an easy to make pasta salad perfect for summer potlucks and barbecues from Serena Bakes Simply From Scratch. 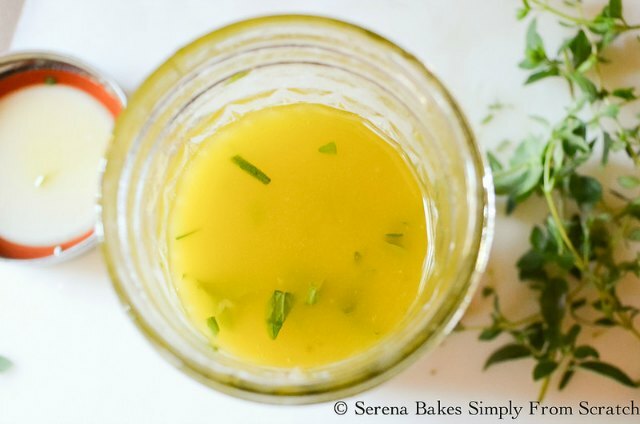 In a jar with a tight fitting lid shake together olive oil, white wine vinegar, rosemary, oregano, thyme, garlic, and salt until well combined. 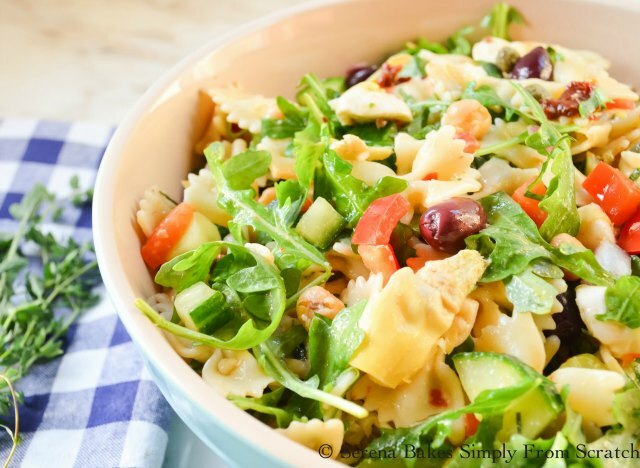 In a large bowl toss together pasta, garbanzo beans, artichoke hearts, olives, bell pepper, cucumbers, red onion, capers, sun-dried tomatoes and mozzarella cheese. Drizzle 3/4 of the fresh herb vinaigrette and stir until well combined. Drizzle with additional vinaigrette as needed and refrigerate until cold. Add Arugula and basil before serving or packing for travel. Stir until well combined. Salad perfection. I could eat this for days. So much deliciousness packed into one amazing salad! Love the use of arugula in this too! I bet that really adds a nice touch! Looks so good. Arugula is so good and I can't wait to try it this way. 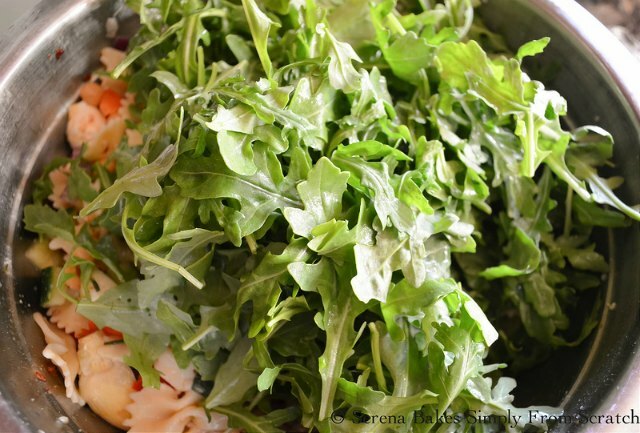 Loved that you added so much into this salad and then finished with the peppery arugula. Home run!! I love everything about this salad and that dressing recipe sounds delish! Oh, and I LOVE chickpeas! I love this whole thing! 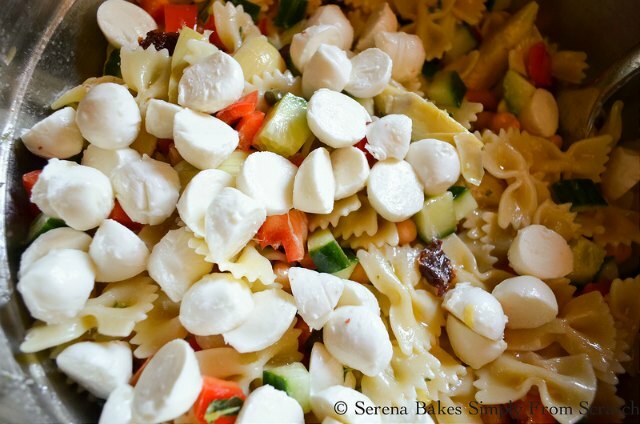 From the pasta and mozzarella to all the vegetables, this sounds perfect for summer. This salad is colorful and so pretty. I love all the ingredients! 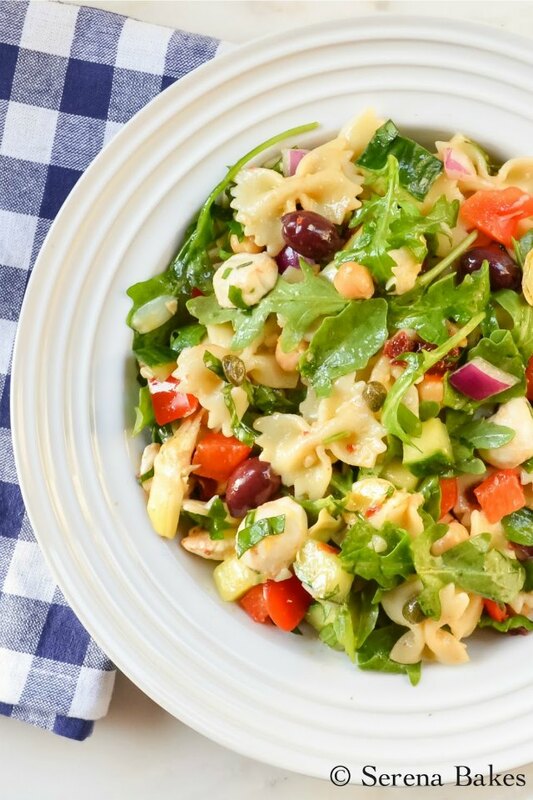 These are the best flavors ever to use for pasta salad! Oooh, I love all your salad ingredients! 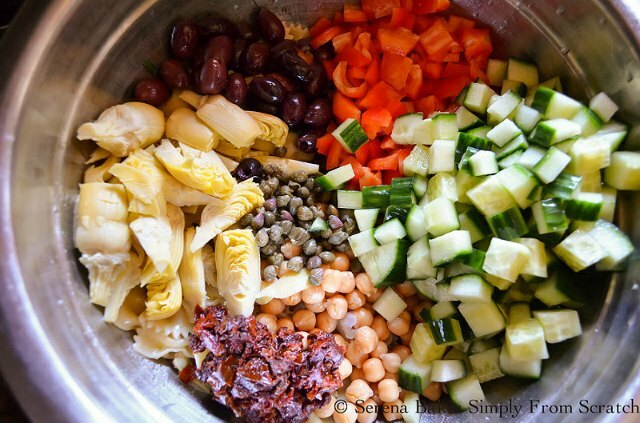 I'm going to make a chopped Mediterranean salad tomorrow and you've inspired me with your gorgeous dish! This is exactly the kind of salad that I love!! I was JUST looking for a fresh pasta salad like this! How perfect! This salad looks so refreshing and flavorful! I bet this is perfect for summer gatherings! This is the kind of pasta dish I could eat all Summer. Love all the flavors. 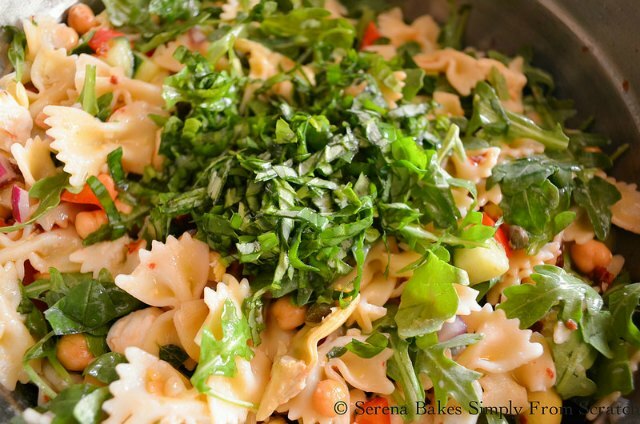 Love the fresh greens in this pasta salad.